Let us begin by talking about the beginning of Evensong, and then introduce the band to the world who have yet to hear your works. 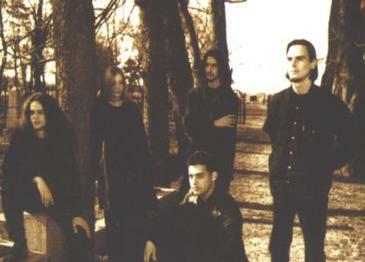 In the autumn of 1997 we recorded our demo called 'Lost Tales.' With this we did a contract with Displeased Rec. 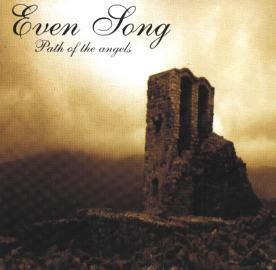 In September of '98 we recorded our first album 'Path of the Angels.' It came out in the March of '99 on Displeased Rec. Our new album 'Of Man's First Disobedience' (Expulsion from the Divine Abode) is ready now. It will out in May of 2000. Tell us about your latest release, 'Path of the Angels,' and also about what you are currently working on for your next release. Will it be in the style/vein of your last? It's an atmospheric metal album filled with deep emotions, or at least I think it is. As I said before, we finished our 2nd album, it's called 'Of Man's First Disobedience' (Expulsion from the Divine Abode). We recorded it in the Harrow Studio in Holland , and we are very satisfied with it. It became more complex than our previous album. We named its style 'Avantgarde Metal Opera.' I think we were able to do something individual. Were any of the members involved in any other bands/projects before Even Song? Yes, Mihaly Szabo and Gabor Olah were the members of another band before Even Song ,called Solitude. The played gothic metal and recorded 2 demos, but after that they disbanded. Many listeners these days have negative feelings toward bands that use female vocalists, saying that it is a trend started a few years back. And in a lot of cases, this is true. Tell us your thoughts on the topic. Look, I think when we started, it was no trend to use male and female vocals together. I know that we are not the first band who are using that, but we don't like to assimilate to any other band. We just want to walk our own way, and if you listen to our new album you will understand that. Being from Hungary, a country which we don't often get a chance to deal with, could you tell us about the national metal scene there? Perhaps give some exposure to some bands from your area that are less known? There are some talented metal bands in Hungary, but there are very few possibilities here to break out. For example 'The Art of Dethronement,' 'Dying Wish,' who already made some demos, but they are only known in Hungary. Another band called 'Sear Bliss' is known in Europe. They play individual black metal, but they had problems with their rec. company, Mascot rec., and they broke the agreement with them. As I know, nowadays they looking for new a recording company. Your lyrics deal a lot with topics of sorrow, and the music matches this direction. Tell us the inspiration behind this... and tell us about some of the negative aspects of existence you have observed. Firstly, I must say that all the lyrics are written by Mihaly Szabo, except "Oblivion" by Tamas Botyanszki and "Evensong" by me. So Mihaly is responsible for the most of the lyrics, I just make statements in my name. I know Mihaly takes inspiration from nature, dreams, philosophizing, reading others lyrics, etc., and so do I. To answer the other part of your question I hate the weakness of mankind, the barriers of the human body and the helplessness as you must see others dying , and knowing perhaps you'll be next. Where did the name Even Song derive from? It means evening prayer. Not a Christian prayer of course. Prayer for beauty, perhaps. To the people who have yet to hear your music, but might be interested, explain what makes Even Song unique and worthwhile to go out and obtain. The atmosphere which fills our music. To the more non-music oriented end of this interview... tell us what you hope to accomplish personally before your end here on Earth? Like everybody, I would like to make something memorable, perhaps with our music I can do that. I can't build a pyramid, you know (ha-ha). What things do you find most important to life, are there things that you would lay down your life for? Yes, love, music or something else that's really important to change the entire world or something like that. When you envision death, what do you fathom awaits you behind its shadowy veil? What are your thoughts on censorship? Political correctness? Do you also feel that these things limit the human spirit? I hate censorship. Yes, I think it limits the human spirit. As I know, in your country there is very strong censorship on everything. I think this is pharisaism. The state wants to control the human mind. In my country there is very little censorship on music, I can almost say that there is no censorship on music here. I don't know what will the end of this, but nothing good I'm sure. Unfortunately I can't say that money means nothing for me at all. If I want to live my life I must have money. But money is not the most important thing in my life, a lot of thing are more important than money. A person is determined by his/her actions and thoughts and not by his/her money. We don't do the music because of money, otherwise we wouldn't play this kind of music. When you compare the old world to the new, what elements would you say the current world lacks that the old one possessed? What are your thoughts on religion? Can you tell us anything about the pagan Gods of ancient Hungary? I don't like religions. Most religions are fantasizing their followers, the leaders of the religions control people in the name of their gods ,and the believers believe anything blindly of what they say. The totem of the ancient Hungarians was the Turul , a mythical , large bird of prey. This wasn't a real animal, but a spirit, the spirit of ancient power and pride. Our forefathers were nomads, but the origin of our people is a controversial matter. They sacrificed to trees and springs and they believed in a life-tree that enabled contact between the real world and the other side. The shamans were the religious leaders, they could see the future through dreams and ecstasy. And back to the music with a few closing questions... any plans for a website any time soon? Yes, we want to make our own website with a lot of information, some tracks (probably a new one among them) lyrics, etc., but I don't know when it will be ready. Do you have plans to do any touring? Yes, but it's up to Displeased Rec. What can be expected from the future of Even Song? As I said before our new album will be out soon. We hope that it will reach as many people as possible. We will surely make a little tour in Hungary, but I don't know when will we go to other lands. Thank you for this interview, greetings to the metal fans all around the world. Words of wisdom?... I know everybody says this, but, be yourself!